Axial’s value proposition for investment bankers gets put to the test every time a deal comes to market using our buyer intelligence and deal management tools. The faster Axial can help bankers connect with an appropriate number of ideally matched buyers or investors, the more the banker improves the certainty of getting a great deal done. We recently had a chance to benchmark Axial’s buyer recommendations to the target lists across 14 deals from three leading lower middle market investment banks. These banks have global footprints, highly recognized brands, and strong in-house CRM/database systems. On average, there was only a 3% overlap between the target lists created by the bank and those created by Axial. All 14 deals in the study were for lower middle market companies. Client names were kept confidential, but we were given access to all necessary information including financials, the specific industry the company was in, and the markets they served. The 14 deals we looked at covered companies across a broad mix of industries including Business Services, Consumer Goods, Food & Hospitality, Healthcare, Industrials, and Technology. There was also a mix of business models: manufacturing, retail, services, software, and distribution. The overlap of targets was small. In four cases, Axial’s buyer recommendations were 100% additive. Across the remaining 10 transactions, Axial’s recommendations only overlapped with the bank’s lists by an average of 3%. On the average deal, Axial brought 50 new, motivated targets to the table for consideration. On the average deal, Axial brought 50 new, motivated targets to the table for consideration. 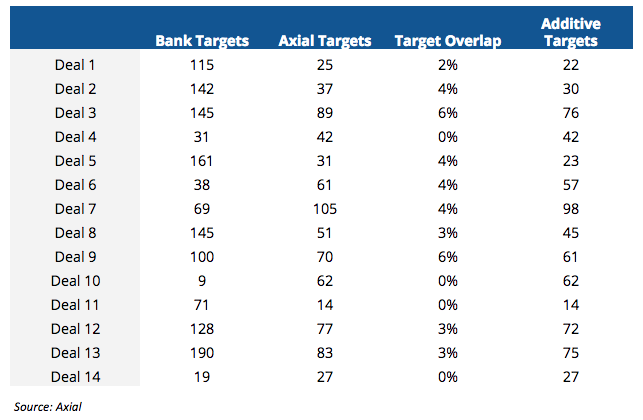 In most cases, Axial’s target list was smaller than the bank’s, but this wasn’t surprising to us. Even though Axial is adding 30 to 40 new buyers a month, its coverage of the buy-side still has a lot of room to grow. We were curious to know how many of our new recommendations were because the banks didn’t know the potential buyers at all, or if it was because they didn’t know the full extent of the buyers’ strategies. While we didn’t have access to the banks’ databases, we were able to see that 46 different buyers showed up on at least one target list from a bank, but were missing on another deal that would also have been attractive to that buyer. We don’t see this as a fault of the banks, but rather a long-time reality of the old way of handling buyer lists. Trying to stay on top of the lower middle market is simply not a human-scale problem. After all, there are thousands of PE funds, emergent family offices, a rising class of impressive independent sponsors, and tens of thousands of potential corporate acquirers (both sponsor-backed and not). But wait, you might say, it’s pretty easy to stuff a target list with names, but how do you know that they are good names. Axial’s investments in and changes to both its technology and its pricing model have led to a huge jump in the quality of our matches. We even have a clear quantitative signal regarding relevance: buyers using Axial’s deal origination tools now actively pursue (by which we mean sign NDAs and/or hold management meetings) 30% to 40% of the deals they source. Want to learn more? Reach out to us here.